The TEP machine was originally designed to meet the needs of boilermakers, by providing functionality for boiler tube processing. We began producing turning systems for this use in the 1960s. Bardons & Oliver has done installations of boiler tube systems in factories around the world. Of late, this has been especially significant in India’s power generation sector, which is growing thanks to an expanded demand for electricity — expected to cross 950,000 mW by 2030. The TEP machines can be created standalone, or designed “head-to-head” (machines opposing each other to pass long tubes from one machine to the next, efficiently and effortlessly) as illustrated below. This system’s two machines and handling equipment can run in-tandem as one unit or independently. Dual-processor CNC controls offer custom screens, which let the user change over from size to size, prep to prep. 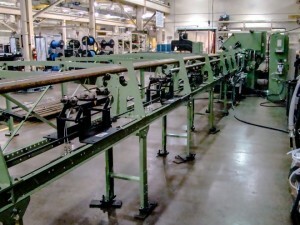 The system can process long tubes on each end without turning the material. These same tubes can be processed into stub up lengths down to 50mm. The TEP-300/350BB systems handle stock at lengths between 4 meters and 20 meters and can output stock at the same size. Pipe is handled by CNC controlled, servo driven rack and pinion tube positioning for consistent and accurate lengths. Precision machining is completed by heavy duty, servo ball screw driven slides. Our systems also can be configured singly (see below), with the option of a “left-hand” or “right-hand” model. Incoming lengths on single-head configurations run between 3 meters and 16 meters; outgoing finished lengths run between 50mm and 3 meters, unloaded to our discharge tables. The primary use for a single-head machine is to cut loose tubes (stub ups) for end product welding. With use of the rear backstop or front stock stop, long tubes can be machined, cut to length and finished parts discharged into unload racks. What Makes Bardons & Oliver Different? Our solutions aren’t “out of the box, one size fits all”. We design our systems to meet your process needs. Bardons & Oliver supplies a fully integrated system, including machine and handling equipment for the input (loading) of raw material as well as the output (unloading) of finished product. Bardons & Oliver is a single source supplier of a “turnkey” system. Bardons and Oliver’s past and present work on behalf of many producers in the boiler tube industry means we understand what is trying to be accomplished, and can work with your company to provide a cost effective, efficient system. Bardons & Oliver also provides top-notch world-class, proven technical support, including manufacture and stocking replacement parts. Contact us to learn more about the TEP300/350BB systems and how they can help your boiler tube business grow with the market.